The Man and I tend to say Van Life! to each other when things go wrong. We may mutter the words while shaking our heads or say them with glee, but when we lose something in the vortex of the van; spill the entire contents of the dog’s water bowl onto the grungy carpet; or the New Mexico wind is too strong for cooking outside, and one of us is on our knees on the dirty floor trying to make dinner, it’s Van Life we blame. In response to the occasional hardships of living in the van, I got to thinking about the joys of van life. I came up with 10 things I love about van life, in no particular order. #1 No toilet to clean–ever! #2 Less space in which to lose things. 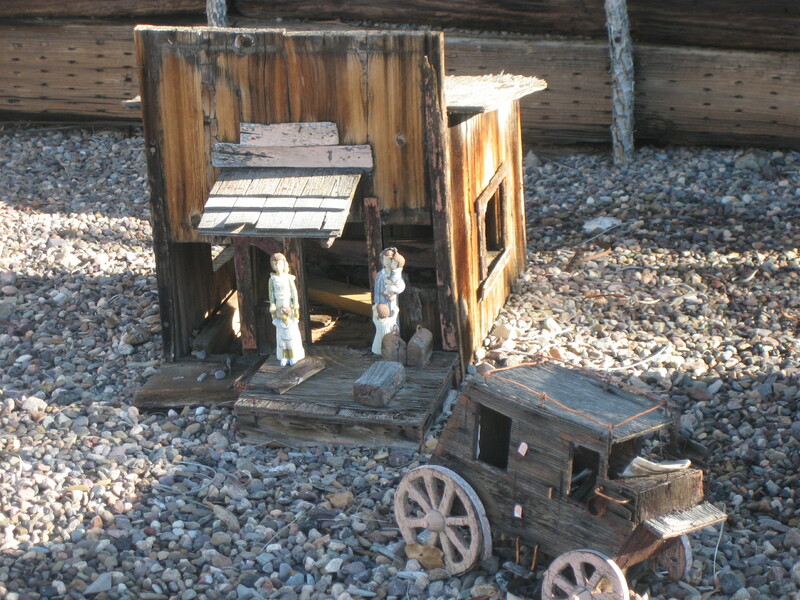 (Although, believe me, with two people living in the van, things are often misplaced. I think things are sucked into an invisible van vortex) At least when I lose something, I know the lost item is in the van somewhere. #3 I’ve got interesting travel stories to tell at parties. 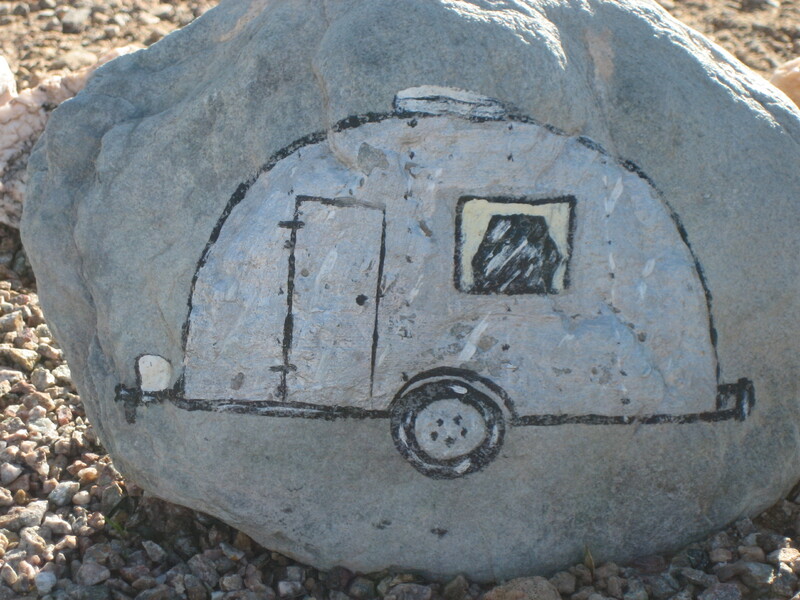 #4 No rent to pay for a sticks and bricks dwelling, and I don’t typically stay at campgrounds that charge fees, so I can spend my money on fun and not on housing. #5 If I get tired of living in one place, it’s easy to go somewhere else. I barely even have to pack! #6 On a related note, if I end up near neighbors I don’t particularly like, I can leave. #7 I can also move with the weather. No more being stuck in snow! No more being stuck in the heat! I can move up and down in elevation when I get too hot or too cold. #8 Most of my meals are picnics. #9 Beautiful landscapes are often right outside my door. I took this photo of the view from the van’s windshield in April 2017. 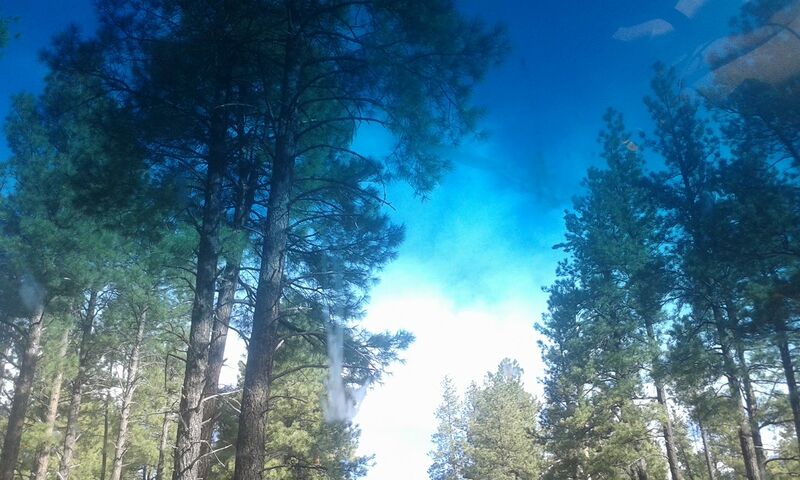 This forest is right outside Flagstaff, AZ. #10 I can get the entire van home clean in less than a couple of hours. I wonder what other folks love about van (or car or Jeep or SUV or RV) life. 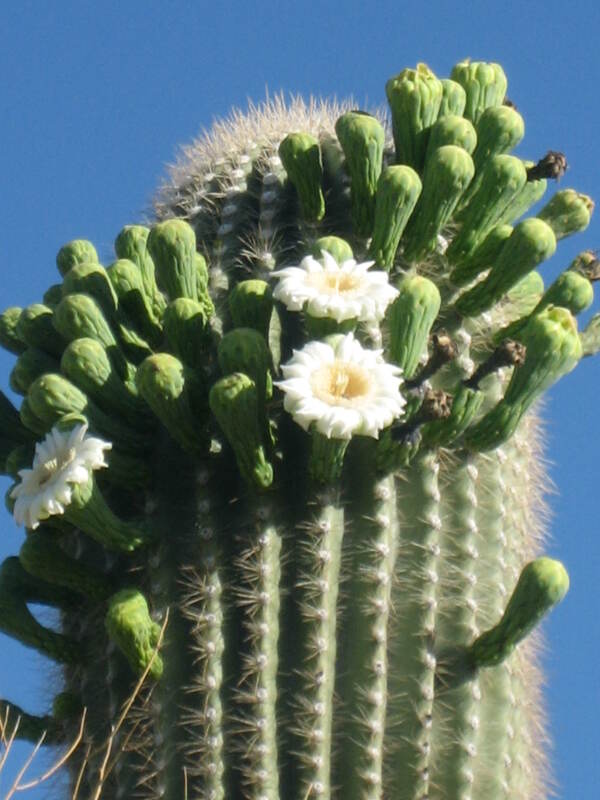 Feel free to leave comments about your favorite parts of your transient way of life. And as always, feel free to ask me questions about my van life. 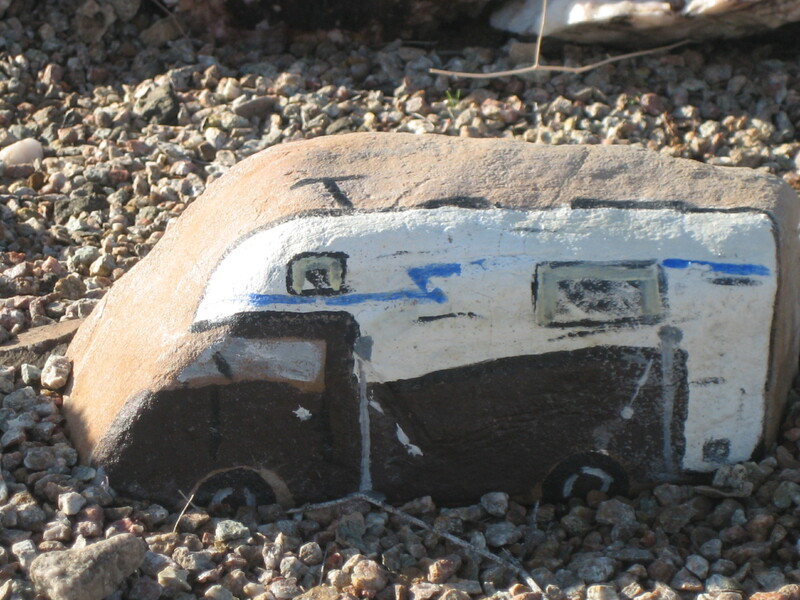 To read more about why I like living in a van, go here: http://www.rubbertrampartist.com/2017/01/01/ten-reasons-i-like-living-in-my-van/. 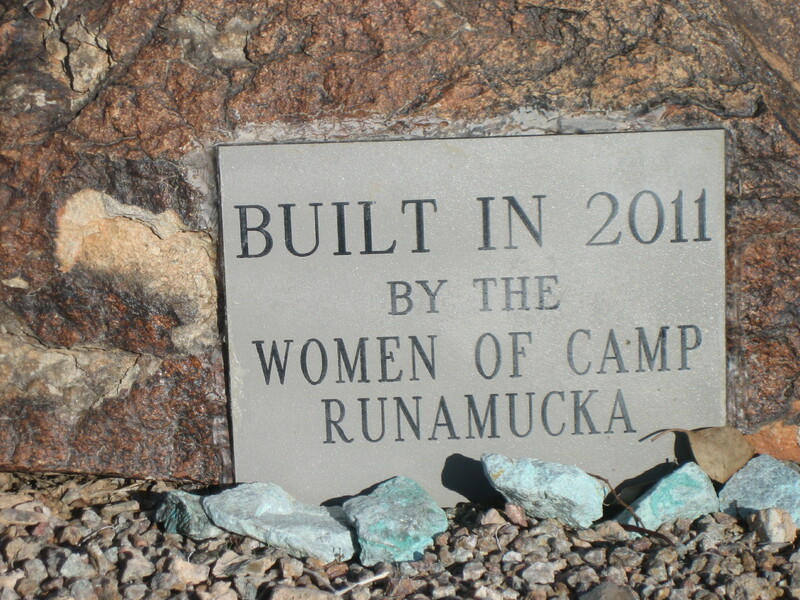 I heard of Celia’s Rainbow Gardens after my first trip to Quartzsite, AZ for the 2015 Rubber Tramp Rendezvous (RTR). 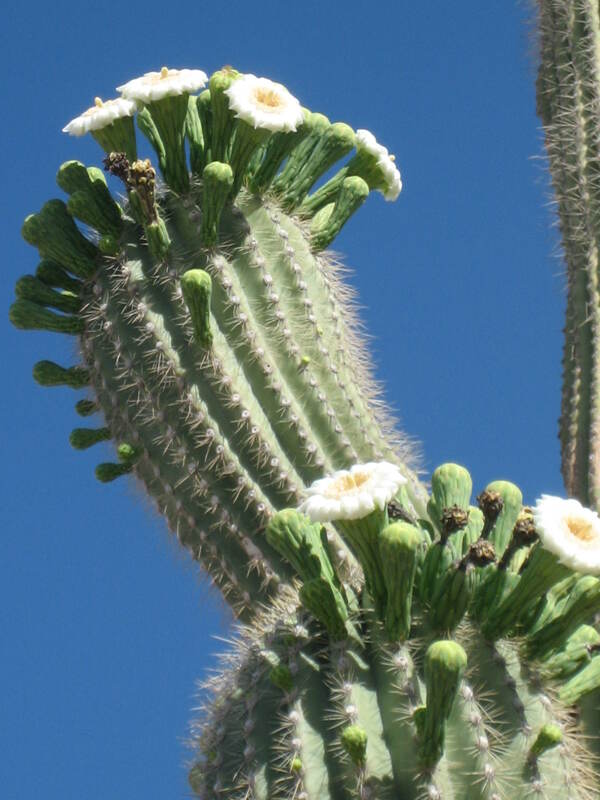 Someone else who’d been at the RTR wrote about the gardens on her blog, and I was sorry I’d missed them. 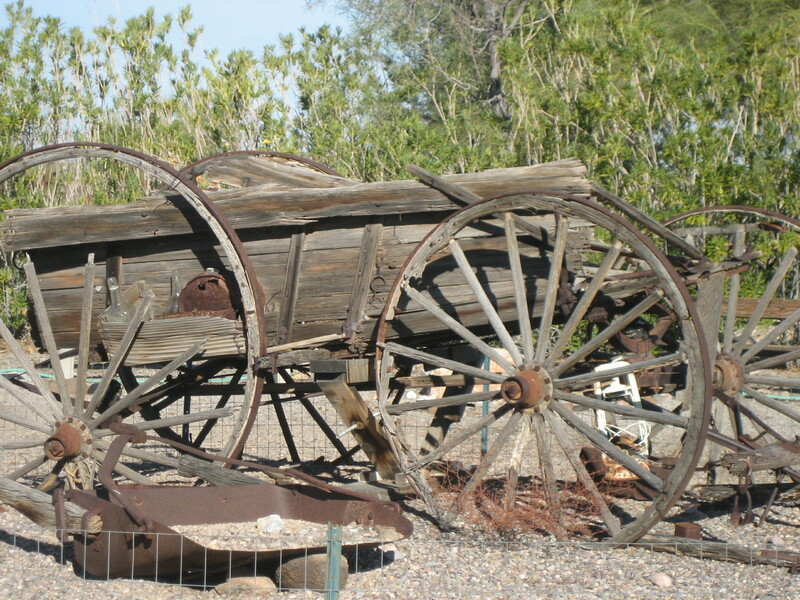 But I missed the gardens again both times I went through Quartzsite on my way to California, and I somehow managed to not make it out there when I was in town for the 2016 RTR. I vowed I would go to the gardens in 2017, and I did. 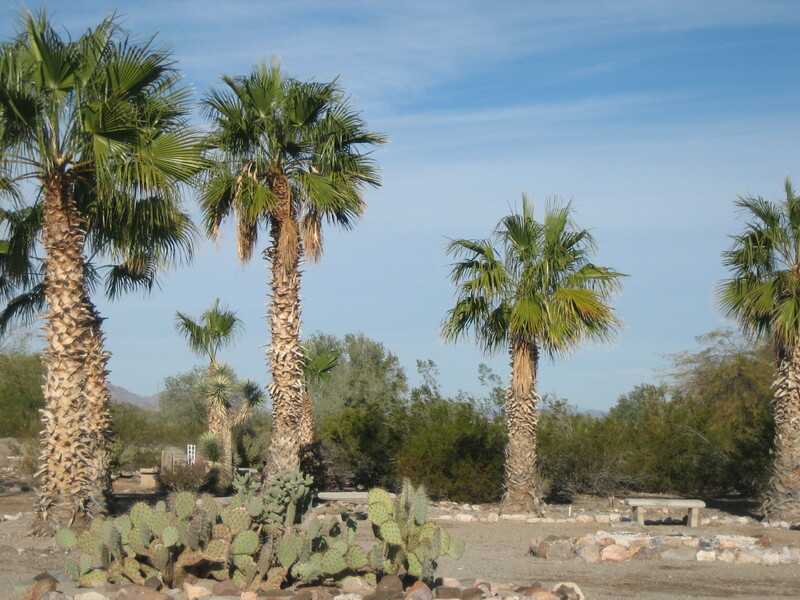 Celia’s Rainbow Gardens, located in the Quartzsite Town Park encompass 8 acres of the 40 acre park. The gardens were inspired by the dreams of Celia Winer, an 8-year old girl whose goal in life was to make the world a better place. 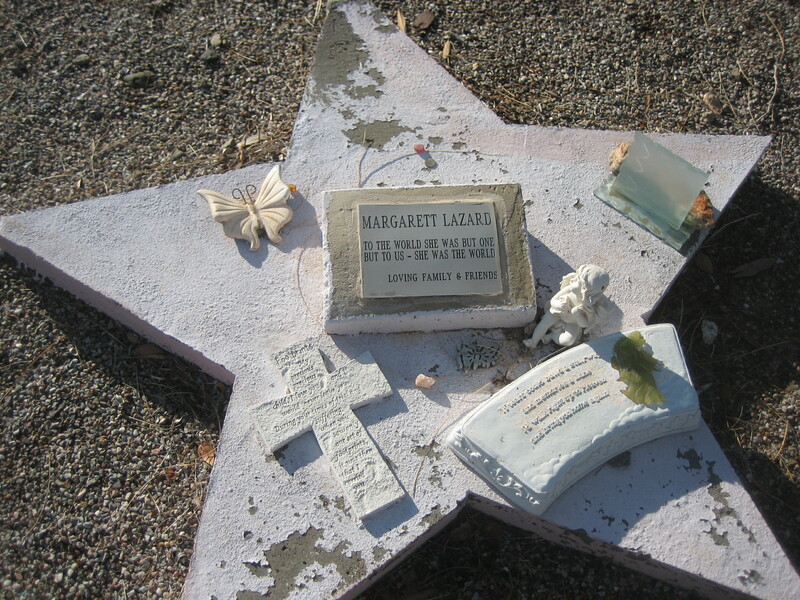 One of the “memorials to dead people” found in Celia’s Rainbow Gardens. Celia was not yet nine years old when she died in 1995. 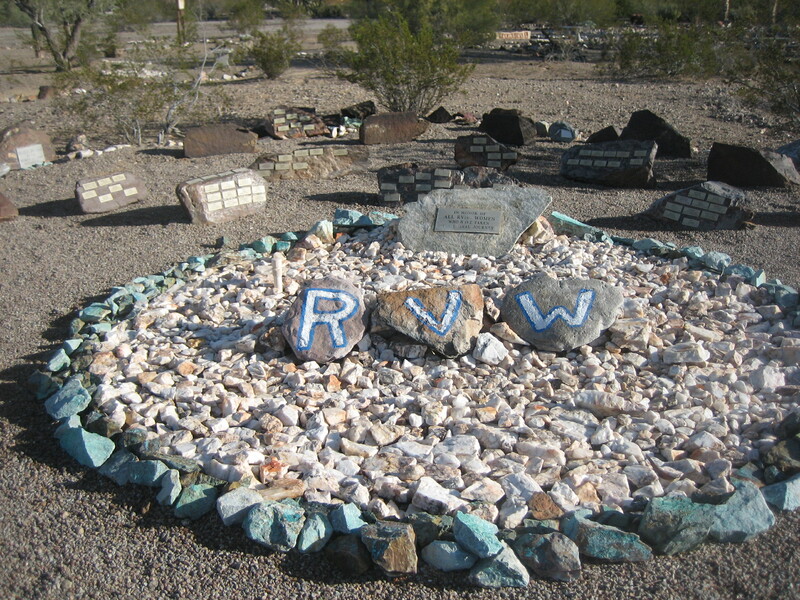 The town, assisted by local RV’ers, built a garden of rocks in her memory that continues to grow with memorials to dead people. 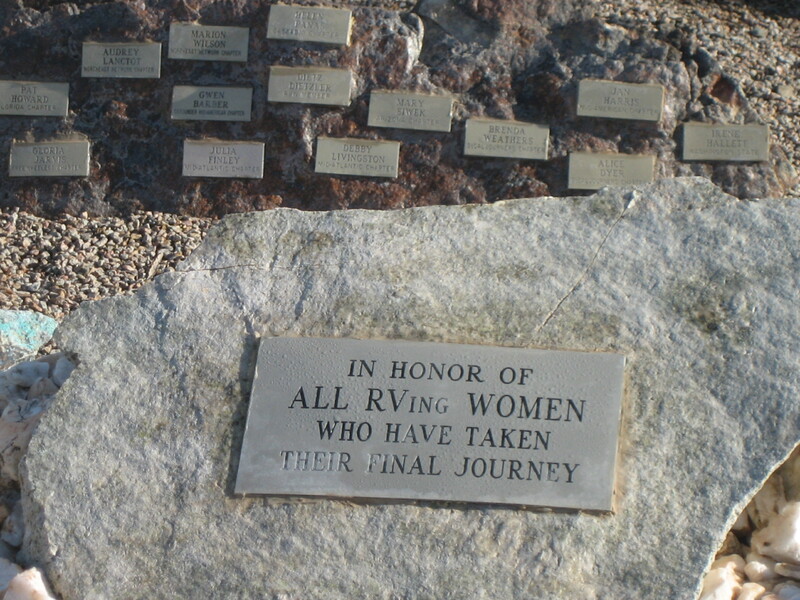 As someone who likes cemeteries I enjoyed walking around and looking at the memorials in the gardens. 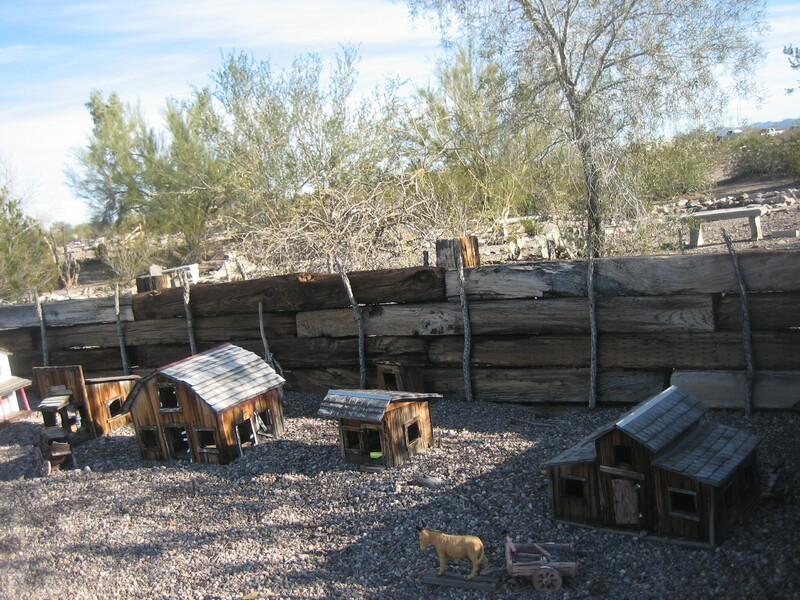 Many snowbirds come to Quartzsite year after year. Many of these folks never know each other in their hometowns or even their home states. 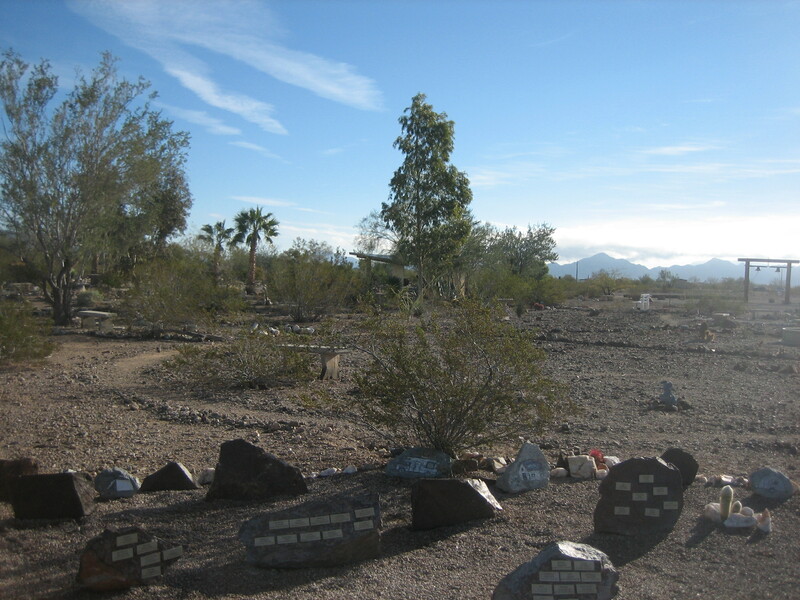 When a member of a Quartzsite snowbird community dies, it must be nice for the survivors to have a place in the town where the friendship thrived to pay their respects and remember their friends. archway [is] made of telephone poles with a cross beam on which two huge iron bells [are] suspended. 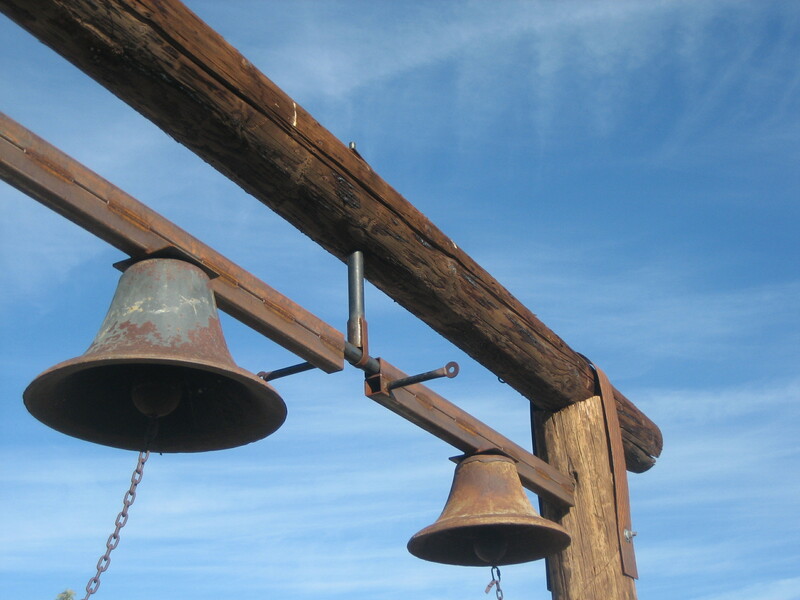 These bells can be rung during special services. 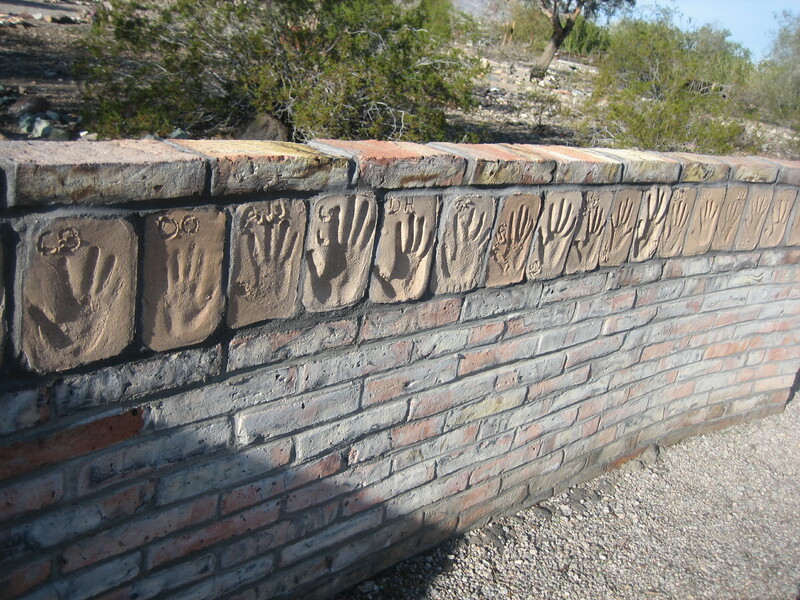 who are remembered…It [is] surrounded by a low wall with the handprint bricks made by the children Celia went to school with. [t]he large palm [sic] in this semi-circle were donated by Main Event owners Howard and Marilyn Armstrong, and were planted by his crew. 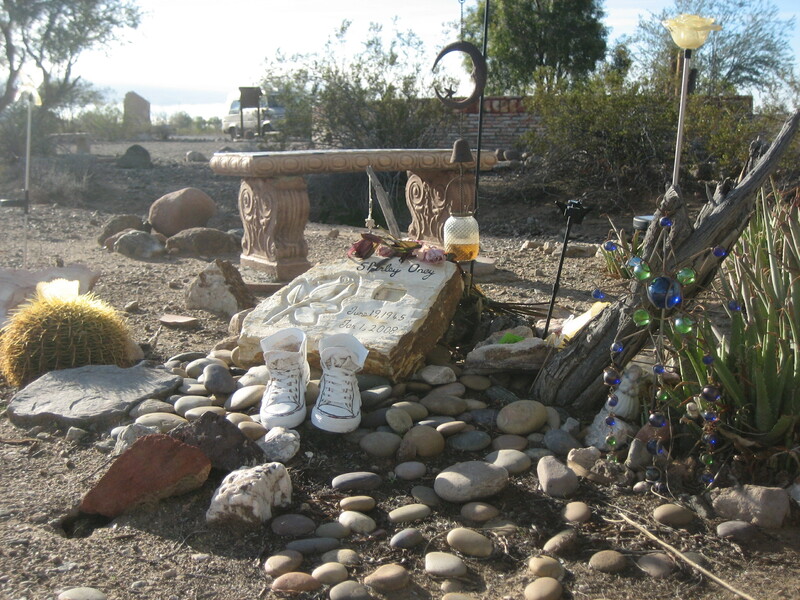 There are benches in this area and throughout the park so visitors have places to sit and reflect, pray, or meditate. 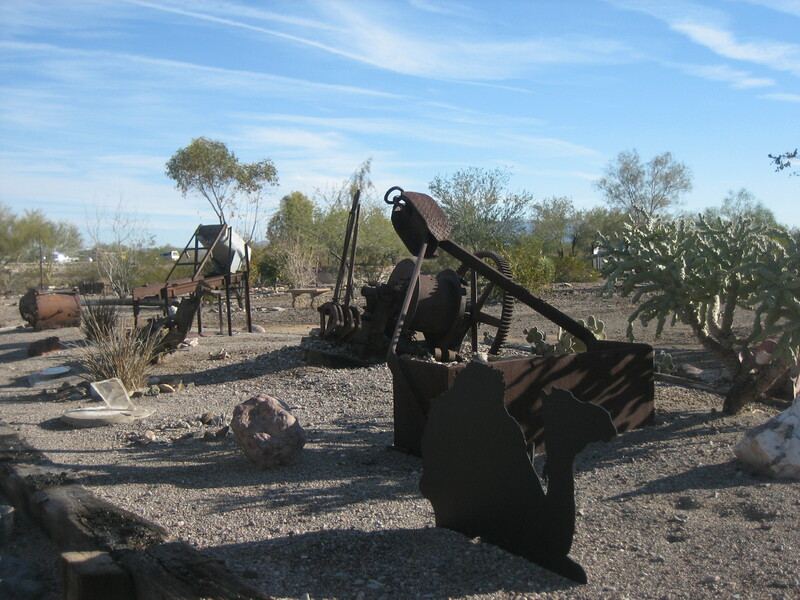 mining equipment display donated by BLM, showing some of the early equipment used in the mines in this area. 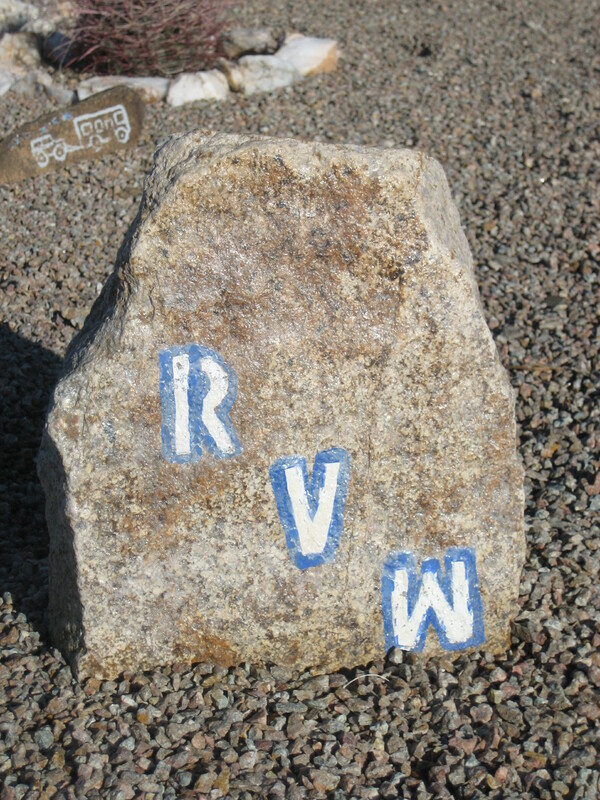 Of course, nothing in Quartzsite which might draw visitors from out of the area is complete without at least one reference to a camel, so there is a camel silhouette in this area too. 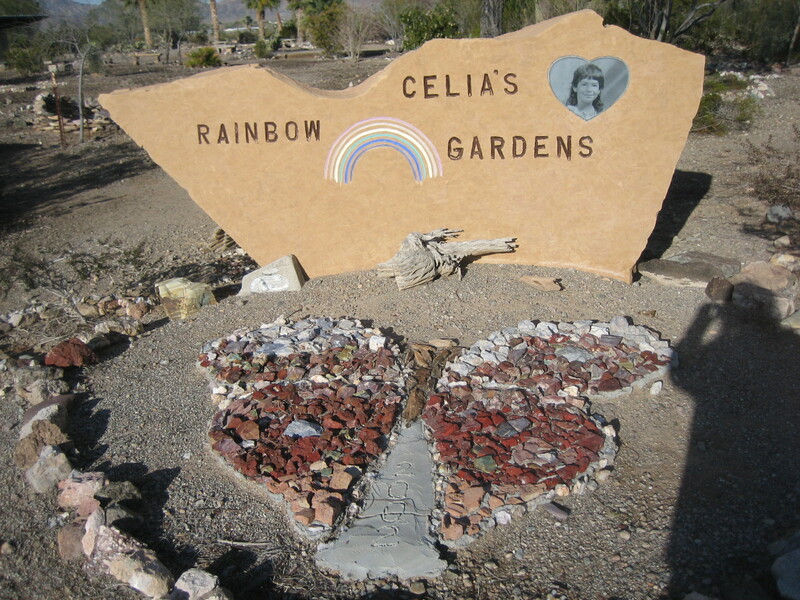 Celia’s Rainbow Gardens offer folks the opportunity of some quiet space away from the hustle and bustle of Quartzsite commerce. However, even in January, the sun was strong and I got warm pretty quickly. 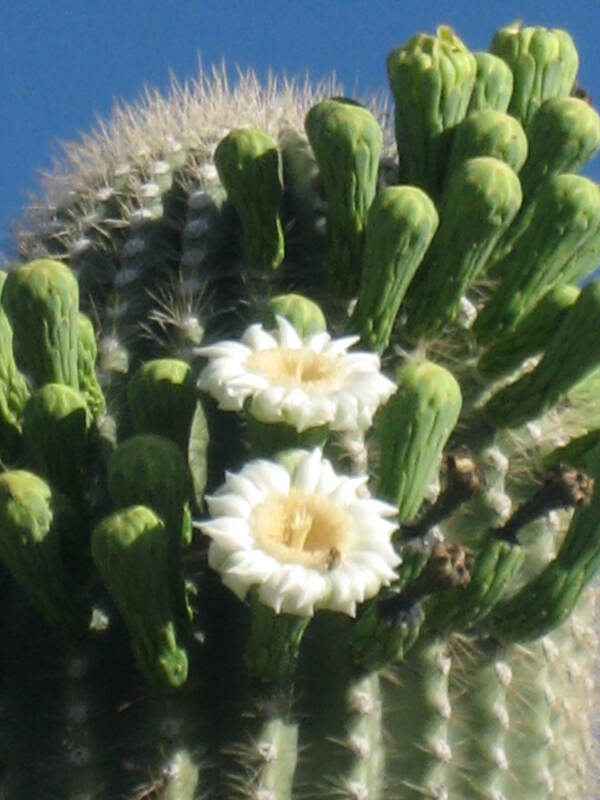 The gardens are nice to visit, but as when you do anything in Quartzsite, even in the winter, bring a hat and some sunscreen and a bottle of water. 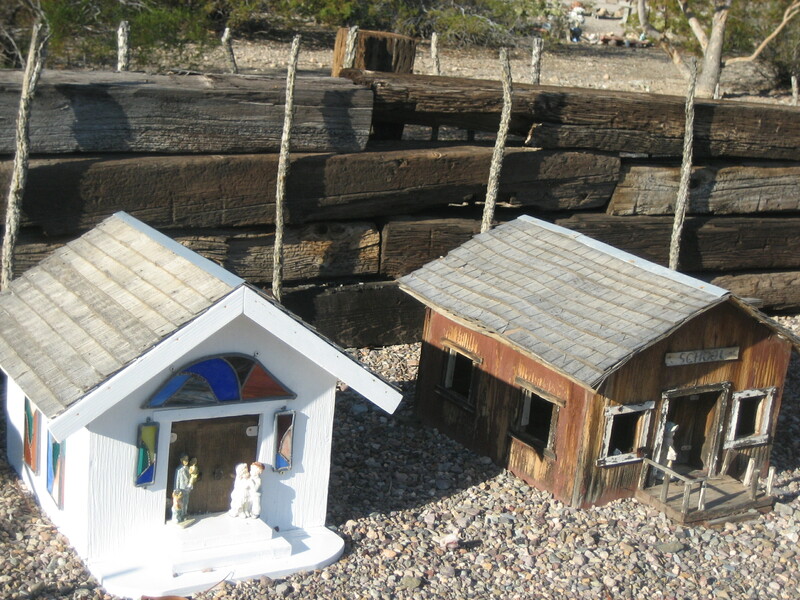 The Roadside America website gives directions to get to Celia’s Rainbow Gardens. I want to say I was kicked out, but that would make the event a little more dramatic than it actually was. I was in Truth or Consequences, at Passion Pie Cafe, as I’d been so many times before. I was there primarily to drop off my submission for the Valentine’s Day Sacred Heart art contest, but I figured I’d also get some breakfast and use their free WiFi for a few hours while I got some writing done. During past visits to T or C, I’ve spent hours at a time at Passion Pie. I’ve sat there from nearly open (7am) to nearly close (3pm). The workers have always been…if not friendly…gracious to me. Actually, the more often I came in, the friendlier the workers became, maybe because I started to seem like a regular, or maybe because I usually put a dollar in the tip jar. In any case, I’d been there before, hunkered down and using the WiFi for hours. The coffee shop seemed different on this visit to town. Some of the furniture was different, bigger, maybe more comfortable, but with the effect of reducing the seating in a small room that already couldn’t accommodate everyone at the busiest times of the day. I’m not sure why the owners of a coffee shop would want to reduce seating, but that’s what seems to have happened. The workers were different too. On the couple of times I’d already gone in since I’d returned to T or C, I hadn’t seen the woman who’d worked there five days a week during my past visits. She was the woman who was not exactly friendly (at least by my Southern standards), but was always gracious and kind to me. She always offered me a refill on my iced tea and never acted as if I were sitting at a table longer than my allotted time. Where had she gone? I don’t know, but the woman working the counter on the day in question was not her. I dropped off my collage and filled out a form with my contact info. Then I ordered a breakfast croissant (no meat, and yes, please, do add tomatoes) and grabbed a scone from the day-old basket. My total came to almost $9. I pulled out my debit card, signed the screen with my fingertip. This, I think, is where I made my fatal mistake. I forgot to leave a tip. I usually leave a tip. I’m superstitious about leaving tips, a holdover from my days as a guest house concierge when I was paid cash commissions on tours I sold. I have to keep that cash flowing, I came to believe. If I don’t share the cash I get, I won’t get any more cash, I came to believe. Maybe because I’d been out of the cash economy for a couple of years, I’d forgotten my own superstition. Maybe because I paid with a debit card, I’d simply spaced on the tip. Maybe it was the signing my name with my forefinger that threw me off. The bottom line, I realized later, is that I failed to leave a tip. In my own defense, the service offered at Passion Pie is minimal. I ordered my food from the woman working the counter. She rang up my total and collected my payment. Then she took one step to the window into the kitchen and called out my order to the cook. When my food was done, the cook placed it on the counter and called out my name, at which time I walked over and picked it up. The woman at the counter didn’t offer me any extra or special service. She didn’t even carry a single item out to my table. Still, I probably should have left a dollar in the jar. I picked a very small table with two chairs. My laptop barely fit on the table, but I didn’t want to take up room I wasn’t entitled to. Also, the battery on my laptop no longer holds a charge, so I must always be tethered to an electrical outlet. The table was near an outlet. I pulled out what I needed for my writing, plugged in my laptop, signed on to the internet. I balanced my breakfast on the edge of the table as I scarfed it down. Then I got to work. The cafe was fairly busy as people came in for coffee and breakfast. Other tables filled up, and I decided if I saw another single person unable to find a place to sit, I would offer him or her my unoccupied chair. I glanced around and noticed the few outside tables were empty (to be fair, it was a chilly morning), and no one in the cafe was obviously without a seat. A couple of people were in line at the counter, but I had no idea if they wanted to linger in the shop or get their food and beverages to go. She didn’t say, You have to leave! but her message was clear. She wanted me gone. She thought I had stayed too long. I noticed there were no signs proclaiming a time limit on tables or a minimum purchase amount for people who wanted to linger. If there is any sort of official time limit or spending minimum, the information is kept super secret until the worker tells the offender that it’s time to go. At least if there were a sign, I could have made an informed decision about what I wanted to do. I’m confident I would not have bought an overpriced restaurant breakfast and chosen to sit at a tiny table if I had known I would be walking out of the place less than two hours later. I didn’t know what to do other than to gather up my things and go. I suppose I could have argued with the worker, but that’s not my style. Maybe I should have offered her a bribe. In any case, I left. And I haven’t been back. And I don’t think I will go back. But I did get a bit of a consolation prize. My collage won third place in the Passion Pie contest, and the owner of the place wrote me a check for $50. 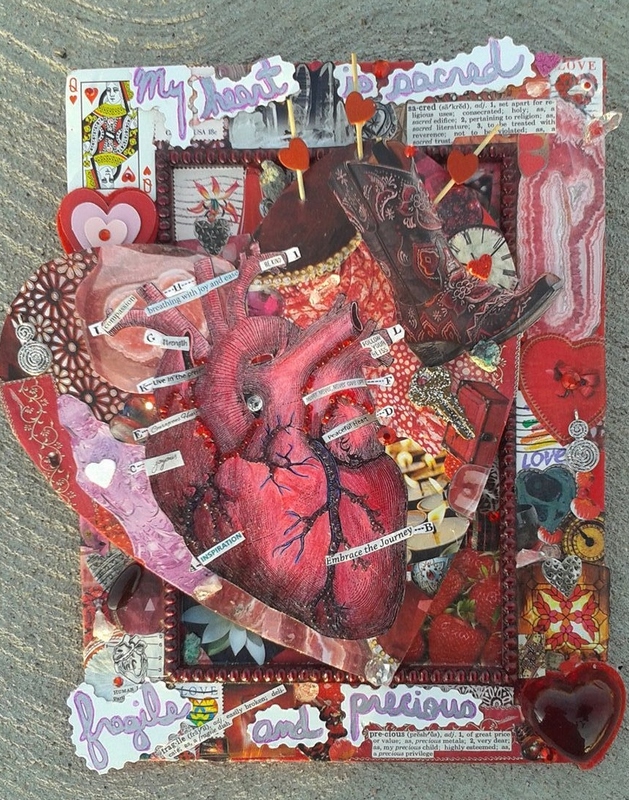 This is my award-winning collage, Valentine for My Own Dear Heart. It won 3rd prize in the Passion Pie Sacred Heart contest. 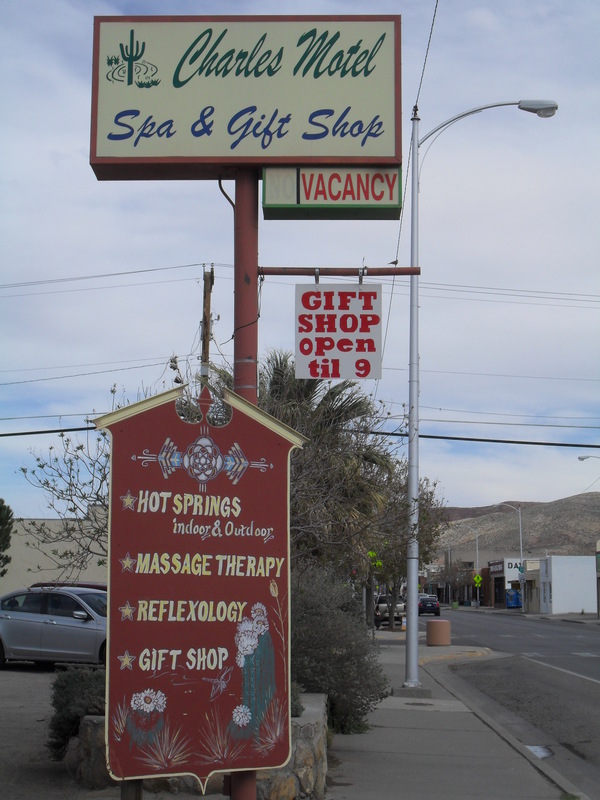 The first time I visited Truth or Consequences, NM in March of 2014, I was not able to soak at the Pelican Spa (306 S. Pershing Street). I called ahead and asked if they accepted soakers on a walk-in basis, and I was told no. Only guests renting a room in one of the many Pelican properties could soak in their hot mineral water baths. I was disappointed because I wanted to try every bathhouse in town, but I soon put it out of my mind. There were plenty of other places in T or C to soak; I didn’t need to pout over the Pelican. In February of 2017, Coyote Sue helped me fulfill my desire to soak at the Pelican Spa. One morning during the time of the great T or C sickness, she texted me and asked what I was doing. I was in town with time on my hands, so she invited me to soak with her at the Pelican. She had some soaking credit there and was allowed to share her tub with a guest. Did I want to soak with her? Yes! I responded immediately. I knew hot mineral water would feel so good to my sick body. Soaking sounds wonderful, I told her. Then I had to ask, Bathing suit? She said she preferred no suit and asked about my preference. We set a time to meet, and I arrived promptly. 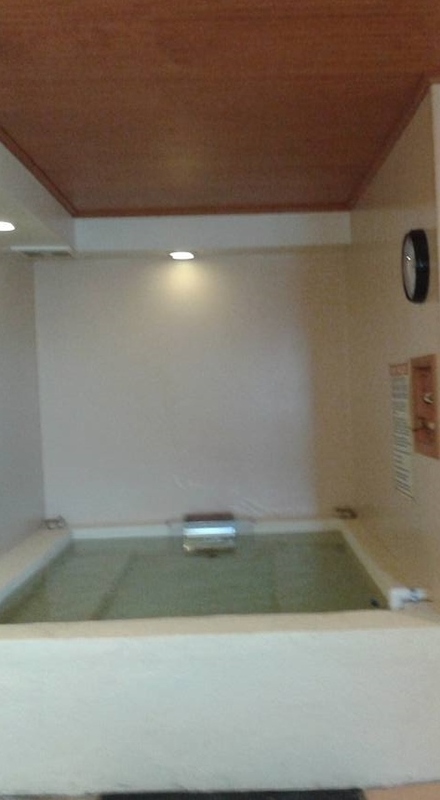 I looked at the Pelican’s website (http://www.pelican-spa.com/), and it seems as if only the only guest room with a mineral soaking tub in it is the Aqua Room. Folks who stay in any of the other rooms can soak in one of the Pelican’s private indoor baths. There are four tubs that fit two people and one larger tub that fits approximately four-six people. Soaking is unlimited and runs on a first come first serve basis. Come soak in the healing. Enjoy our crystal clear, sulfur free natural hot mineral baths with some of the highest natural mineral contents available in the world. Soaks are $6 per guest and available by reservation at the spa. I take that to mean soaking is available to the general public, with reservations, but I don’t know if that $6 is for an hour or only half an hour. An email (seaproptorc@yahoo.com) or phone call (575-894-0055 ) to the Pelican’s office should clear up the mystery. The tubs available to the public are housed in small private rooms with doors that latch. The soaking rooms are near the office, and Coyote Sue led me in like someone who already knew her way around. The room we went to was small, but with enough room for us both to move around and remove our many winter layers. The room was also clean. Our tub was maybe a little longer than a standard bathtub, maybe a little wider, but substantially deeper. There was room for both of us, and I didn’t feel crowded. The water was delightfully hot and my weary body relaxed into it as Coyote Sue and I chatted. I wish I could say the hot mineral water healed me, but in reality, I stayed sick for quite a while longer. However, the water and the conversation did reduce my stress and lift my spirits. The free soak was a wonderful gift from a friend. Now if I could just figure out how to gain entry to soaking at Fire Water Lodge. While I’m on the subject of bathhouses in Truth or Consequences, I’ll share my most recent experience at the Charles Motel and Spa (601 N Broadway Street). Every since I first visited T or C, I’ve frequented the Charles. I’m not sure what the current prices are, but in 2014 and 2015, a person could soak for an hour for only $5, and a towel was provided! I’d heard folks talk about soaking on the roof of the Charles, but I’d never done it. It was more expensive than soaking in the regular bath area, and I didn’t feel as if I needed an entire jacuzzi to myself. However, I found a coupon in the February issue of the free Cobblestone newsletter I mentioned in the post about The Hoosier. The coupon was a two-for-one: two people could soak on the roof jacuzzi for the price of one. Yes! I wanted this! The Man and I had recently become (*clears throat*) friendlier, so I figured it would be ok for us to soak naked together. (Oh! How I hate a bathing suit!) I casually told him about the Charles and the roof and the hot water and offered to treat him to a reduced price soak. He said yes, so I called to make a reservation. I found out the jacuzzi on the roof would be filled with mineral water just like I’d soaked in downstairs. The mineral water was pumped up to the roof, but it was the same good stuff. I asked about the temperature of the water on the roof. 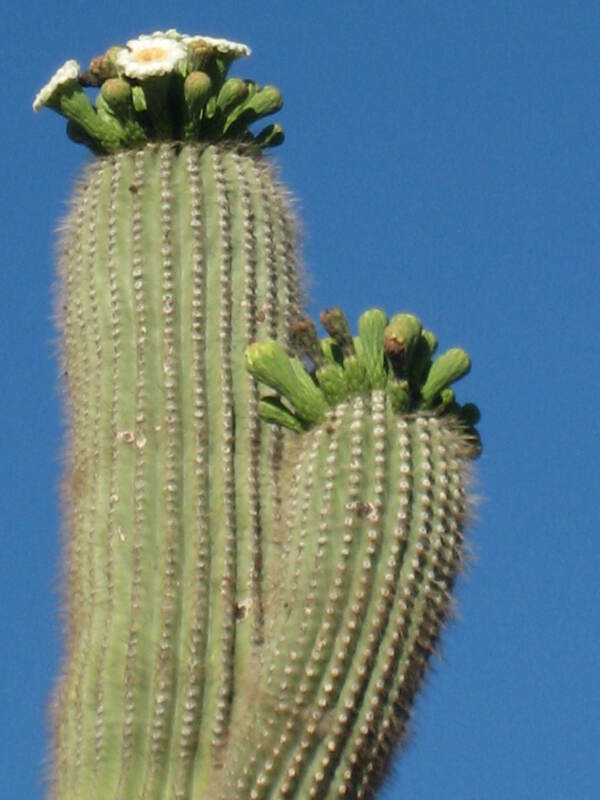 113 degrees, the man on the other end of the phone said. The night we’d pulled into town, I drove us directly to the Indian Springs bathhouse (218 Austin Street) and treated us each to a soak. The Man and I weren’t quite so friendly then, so I’d gotten us separate pools (the price was the same), and let the man have the larger one. When we met up again after half an hour of soaking, he said he’d liked it, but it wasn’t very hot. I hoped 113 degrees would be hot enough for him. We arrived at the Charles a few minutes prior to our 8pm reservation. It was February and already nighttime. I went in and paid the $10 for the two of us. Bargain! The young man working threw in two towels for free, then took us upstairs to show us how to operate the jacuzzi. Once we knew what to do, he took off, closing the door behind him, and left us alone on the roof. The Man decided he had to go back downstairs to utilize the restroom, so I got the hot water flowing. By the time The Man returned, the big tub was filling, and I was somewhat concealed under the water. The Man disrobed, climbed in, and let out a sigh of satisfaction. Yes, it turned out 113 degrees was plenty hot for him. While streetlamps provided light to see by, we still had a good view of the night sky. It was wonderful to soak in the hot water while looking at the stars and the moon. When our hour was up, we drained the tub, dried off and dressed, then made our way back to the van and drove off into the night. It was late January 2017 when The Man and I pulled into Truth or Consequences, NM. I hadn’t been in the town since December of 2015. Not much had changed since my last visit. Passion Pie was still the place to see and be seen, although new furniture had been brought in and everything had been rearranged, seemingly giving the place less seating. The CHF Thrift Store still had the best deals, although I certainly didn’t need any more stuff. The town still basically shut down by 9pm, even on Art Hop Saturday. A few things were decidedly different. The place that had been the Happy Belly Deli during my first visit (March of 2014) was no longer called The Brazen Fox; it had new owners (again) and was called A Little Slice of Heaven. The computer lab in the Senior Center would start closing an extra day each week due to a lack of volunteers. The best change? A new place to soak in T or C’s famous hot mineral water. As is so often the case, I got the intel from Coyote Sue. That woman really knows all the cool spots! She told me about the new bathhouse, a place called The Hoosier (516 Austin Street). She told me she and her sweetie had soaked there for an hour for about $15 for the both of them. Good price! She also said the room with the tub had a shower and since no one was scheduled to come in after them, the owner didn’t hurry them out when their hour was up. On my second day back in town, I was out and about and discovered a free newsletter called Cobblestone which lists all the events happening each month in T or C. One of the advertisers in the February newsletter was The Hoosier. The ad offered two people an hour soak for only $10. Bargain! 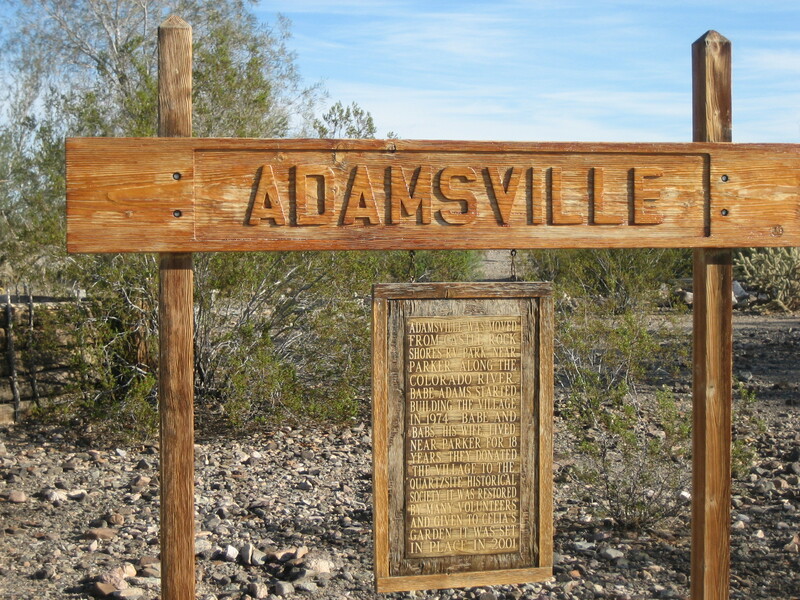 I made a reservation for the next week. 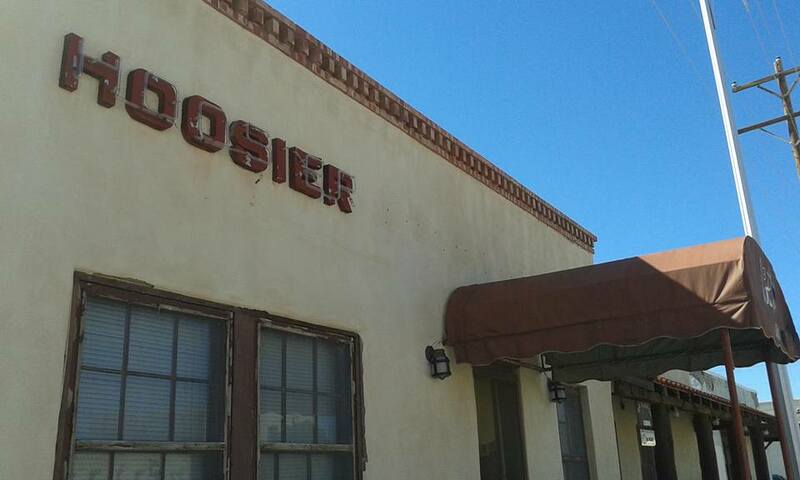 When The Man and I arrived at The Hoosier, I realized I’d passed the place many times before. It’s been an apartment complex for as long as I’ve been spending time in T or C. I didn’t realize it had ever been a bathhouse, although I suspect many of the little apartment complexes in town were bathhouses back in the heyday of the healing powers of mineral water. One of the few bathhouse apartments incorporating elements of the Territorial Revival style, the Hoosier Apartments were constructed in 1937 with additions along the back completed in the early 1950s…The artesian well drilled in 1937 provides water for several tiled baths located in two rooms in the southwest corner of the building.. The Man and I met the owner of the place, who told me the original part of The Hoosier complex had been built in the 1930s, a second part added later. Then he showed us one of his outdoor pools, which was very nice. However, I wanted to soak indoors because I didn’t want to sit in the sun while I was soaking, and it was still a little chilly to be outside naked. So the owner showed us to the room with the indoor tub. The room with the tub was spacious and clean. Since I’d made a reservation, the owner knew when we were arriving and had filled the tub for us. (For this reason, The Hoosier does not accept walk-in soakers; soaking is by reservation only.) After pointing out the small adjacent room with the toilet and shower, assuring us we didn’t need to drain the tub when we were done, and telling us to take our time as no one was scheduled immediately after us, the owner left us to enjoy our soak. Being traveling hippies, baths and showers are sometimes few and far between. One of the reasons I love Truth or Consequences is that a hippie can hang out in the town and not have to be a dirty hippie. Although The Man and I weren’t terribly dirty on the day we visited The Hoosier (we had showered when we visited The Lady of the House and had soaked at two other bathhouses since we’d rolled into T or C), sometimes it’s nice to shower before soaking. Personally, I don’t like to be the dirty hippie who leaves scum in the nice clean bathtub. I scrubbed up in the shower while The Man pulled out his clippers to shave his head. I climbed into the tub as soon as The Man had taken my place in the shower, and it was wonderful. While the water was cooler than at some of the places I’ve soaked in T or C, it was adequately warm. By the time The Man got out of the shower, my core body temperature must have risen, because I was having to sit on the side of the tub to cool down. The tub was quite spacious. The Man and I both fit easily into it without being crowded. Two people who don’t want to touch could easily share the tub without being squeezed together. Four people who don’t mind being physically close could definitely fit in the tub. As I mentioned before, the room was clean. Everything in the room was clean: the floor, the walls, the tub, the shower, the toilet. The paint was fresh. Everything functioned properly and was well-maintained. It’s only recently that the owner set up the tubs for public use, and he’s done a great job. 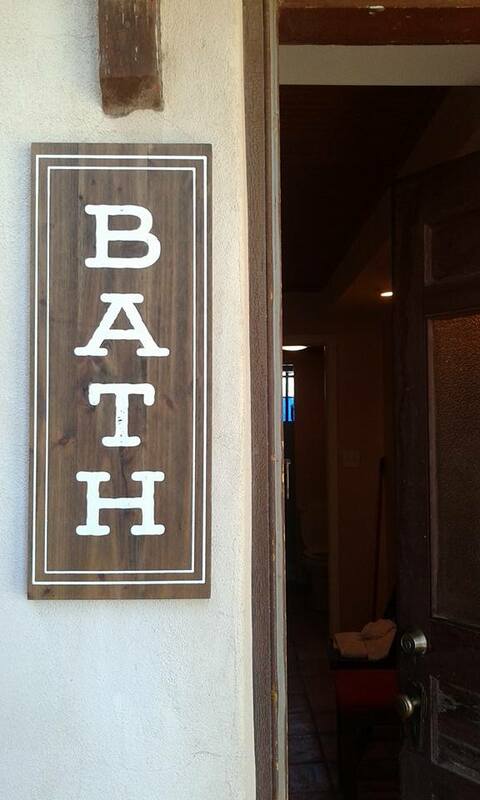 I enjoyed my soak so much that I made a reservation for my birthday later in the month. The second soak was just as wonderful as the first. I recommend The Hoosier to anyone who wants a clean, spacious place to soak and especially to folks who don’t like super hot water and don’t want to be rushed.